For some, it’s about that jaw-dropping moment when they see Mt. Rainer up close for the first time. For others, it’s gazing upon sprawling wildflower meadows, or hearing the squeals of joy as their child spots their first marmot. Still others seek that quiet moment on the trail, clearing the busy mind of upcoming obligations and things to get done. It’s a given that all who visit the mountain will make a connection. What will yours be? 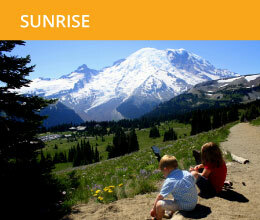 At 6400 feet, Sunrise offers the most panoramic views of Mt. Rainier, with many of Mt. 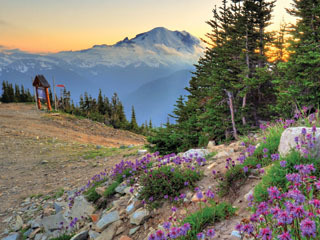 Rainier’s Top 10 Trails. And, of course, it’s a great place to catch the sunrise. Learn more. Visit here for the Grove of the Patriarchs, a stand of 1000 year old trees and Silver Falls, the Park’s largest volume waterfall, plus lesser known, uncrowded trails. Learn More. Photographers love this area for its wildflowers and Mt. Rainier reflections in Tipsoo Lake. 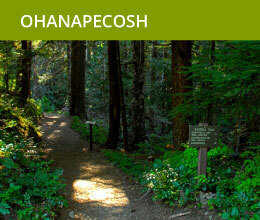 You’ll also love the Naches Peak Loop and access to the Pacific Crest Trail. Learn more. The drive from our side to Paradise is beautiful, through Stevens Canyon & Box Canyon. Paradise is 1000 feet lower than Sunrise, so doesn’t have its expansive views, and is the Park’s busiest area. The Stevens Canyon Road from our side is usually open from late May through late October. 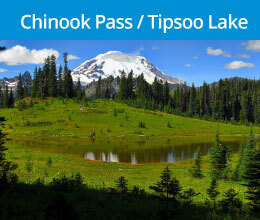 At other times of year, Paradise is accessible via the city of Enumclaw. Read more here. The Carbon River Trail is one of the few places in the Park where mountain bikes are allowed. Few services and lack of vehicle access make this one of the lesser visited sides of the Park. Read more here. The Park’s historic district offers the Trail of the Shadows with bubbling mineral springs. For most, Longmire is not a destination in itself but part of an around-the-mountain tour. Read more here.